hotch potch made up of all the scraps of the larder. Gallimaufry was inspired by Shakespeare’s Henry IV plays, and derives from music I composed for the Royal Shakespeare Company’s production which opened the Barbican Theatre in 1982. The score is dedicated to Trevor Nunn, then Artistic Director of the RSC, with grateful thanks for his suggestion that I should expand and mould the music from these productions into a form suitable for concert performance. My thanks also to Timothy Reynish and the British Association of Symphonic Bands and Wind Ensembles who, with funds provided by North West Arts, commissioned the work and helped to ensure its first performance on September 24th 1983 with the Royal Northern College of Music Wind Orchestra. Advance and Retreat is a recruiting march, derived from the Tavern Tune and leads into the last movement, Church and Status Quo, which deals with the rejection of Falstaff and the crowning of Price Hal. Order is restored with a majestic affirmation of the opening material. 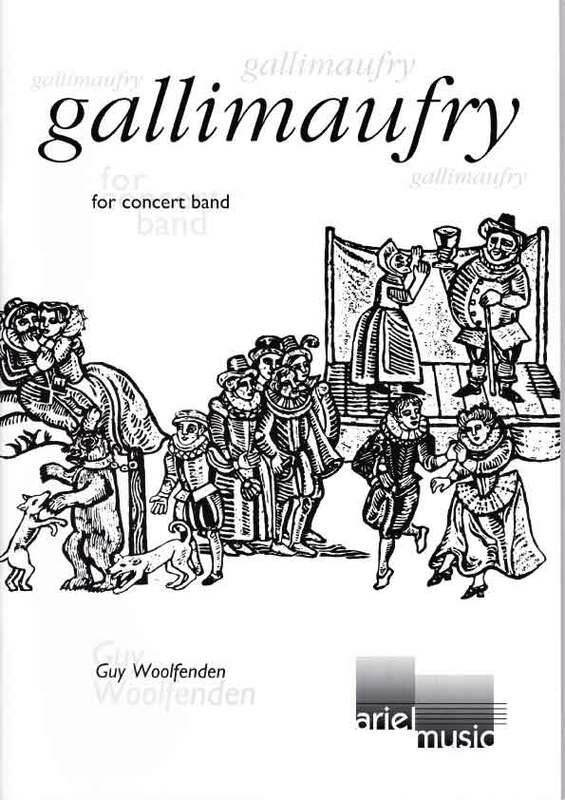 One of the best works for band this decade is Gallimaufry by Guy Woolfenden. This BASBWE commission brilliantly succeeds in evoking the spirit of Renaissance England without ever sounding like pastiche. This is a first rate work, beautifully produced. A piece like Gallimaufry, with its witty ingenuities, expert layout and a tune that stays with you…has helped thousands of players cut their musical teeth and stirred thousands more with the adventure of living music. This is a great CD with the best of Guy Woolfenden’s compositions for Wind Band. Most of these are taken from original scores that have been written for the Royal Shakespeare Company. By far the best piece on this CD is Gallimaufry, a piece in 6 small movements, with exciting hemiola rhythms, syncopations, and harmonies that twist and turn effortlessly into a powerful and memorable piece. The RNCM Wind Orchestra do a great job of playing these works – the performances show great attention to detail, and the movements flow from one into the next almost perfectly. I highly recommend this CD – especially if you have heard some of Guy Woolfenden’s music before, and want a wider collection of his music. When my old friend Tim Reynish asked if I would write a “fifteen minute accessible work for concert band” to have its first performance at the 1983 BASBWE Conference, I knew immediately what I wanted to do and could even tell him the name of the piece: Gallimaufry! The seeds of the idea for the piece had been sown a year earlier, when the Royal Shakespeare Company had left the Aldwych Theatre, our London home of the past 22 years, to move into the long-awaited, brand new Barbican Centre. The Artistic Director, Trevor Nunn, decided to direct Henry IV Parts I and II, to open our first season there, these having been the plays which had also opened the Stratford Memorial Theatre fifty years earlier, after the old theatre had been destroyed by fire. I have to admit that I did not relish the thought of composing new music for these two plays as, during my twenty or so years as Head of Music to the RSC, I had already written scores for them several times. In fact, my first big score for the company had been for the director Peter Hall, who, for Shakespeare’s quartercentenary celebrations in 1964, had produced the complete history cycle, stretching from Richard II through Henry IV, V and VI to Richard III. 1 had also composed the music for Terry Hands’ equally spectacular productions in the mid-seventies. However, the opening of the Barbican was a milestone – how many years had we been waiting for this theatre? – and to work with Trevor Nunn is always a very rewarding experience. The plays opened to very good reviews and, naturally enough, a great deal of ballyhoo concerned with the new theatre. The first night was a night to remember as we were awash with champagne, flowers, good-luck cards and first night presents in the time-honoured tradition of the theatre. When it was all over, Trevor pulled me aside and said I must make some time to mould the Henries’ music into a piece suitable for the concert hall. His words were stored in the back of my mind, until months later when Tim telephoned and I knew exactly what I wanted to do. Why Gallimaufry? Gallimaufry is a rare Shakespearean word meaning a medley, ragout, hotch-potch, or a stew, and aptly describes the moulding together of the many different themes, marches and songs from the plays, that I had to do to recreate this piece. I also think that Gallimaufry seems to describe my musical life: I started out at nine years of age as a chorister at Westminster Abbey, and later joined the National Youth Orchestra as a horn player, where I met Tim Reynish for the first time. We also played together in many orchestras and chamber groups whilst at Cambridge. After Cambridge I joined Norman del Mar’s splendid conducting class at the Guildhall School of Music, and when the time came to earn my living, I applied for a vacancy in Sadler’s Wells’ Opera Orchestra. Tim, as principal horn, was on the audition panel – and we spent two memorable seasons in the pit, parting company again when I left to join the RSC in 1963. Besides the hundred or so scores that I have composed for the RSC. I have also written music for productions at the Comedie Française, Paris, the Burgtheater. Vienna, the Teatro Stabile, Genoa, and from time to time I have supervised RSC transfers to Los Angeles, New York and Tokyo. Last year I wrote the music for a little-known lbsen play for the theatre in Bergen, Norway and my travels have also taken me to Melbourne and Sydney, where I arranged, composed and conducted scores for two three-act ballets for the Australian Ballet, and to Scotland, where I have conducted three productions for Scottish Opera. I have conducted concerts both here and abroad, one of the most memorable being in Paris, when Yehudi Menuhin returned there to play the Elgar Concerto for the first time since his youth. But the main part of my work has been concerned with the music for the plays at Stratford-upon-Avon and the Barbican, where I am lucky enough to have two very versatile bands consisting of flute, oboe, clarinet, bassoon, 2 horns, 2 trumpets, trombone, 2 percussion and music director. And when I say versatile, I really mean it! They can play recorders, rauschpfeifes, crumhorns, dulzaines, cornetti, buccinas, etc., without turning a hair. Our Stratford trombonist, Gareth Richards, can double on the harp, while Brian Newman, one of our Barbican horn players, who is also a fine keyboard player, has recently had to master the banjo and the accordion. One of the most remarkable productions that the RSC has undertaken, happened last year at The Other Place, our little theatre in Stratford-upon-Avon. Barry Kyle directed The Dillen, a play about the life and times of a Stratford man called George Hewins, who died in his nineties in 1976. The play started and ended in The Other Place, but the rest of the action took place on location in lesser-known parts of Stratford-upon-Avon. In order to move the audience on from one scene to the next, it was decided early on that the play would require a great deal of music. As the play was to have about 200 extras drawn from the people of Stratford, besides the professional cast of actors and musicians, I asked Peter Chadwick and the Stratford-upon-Avon Wind Band Association if they would like to join us. Their response was so amazing and their enthusiasm so infectious, that 1 have to admit that I temporarily lost interest in what was going on in the main theatre down the road, and whenever I could I blew the dust off my french horn and joined them! We played The Dillen for about 20 performances throughout August and September, and for every performance the band turned up in force, wearing costumes they had made themselves, and led the audience and performers forward through the play, by taking them down by the river, up along the old railway track and finally back through Old Town in a magnificent torchlight procession. The production was such a success that there are now plans to mount a sequel in 1985. The very warm welcome that has been given to my first piece for concert band is greatly appreciated, and the whole family has enjoyed tearing around the country to hear it played whenever possible. For me personally, it has brought more commissions for the concert hall of one sort or another, which is a welcome change from the theatre – although there is still plenty more of that, as I have several more scores to compose for the RSC this year. When the dust has settled I am sure that kind and unexpected enthusiasm which greeted Gallimaufry will encourage me to write some more works for concert band.